Reports reaching us claim that a young Nigerian lady has gone bonkers after lodging at a hotel with a man in Lagos. The yet-to-be identified lady was captured causing a scene in the early hours of April 14, after she was reportedly expelled from the hotel because of her switch to crazy mode. 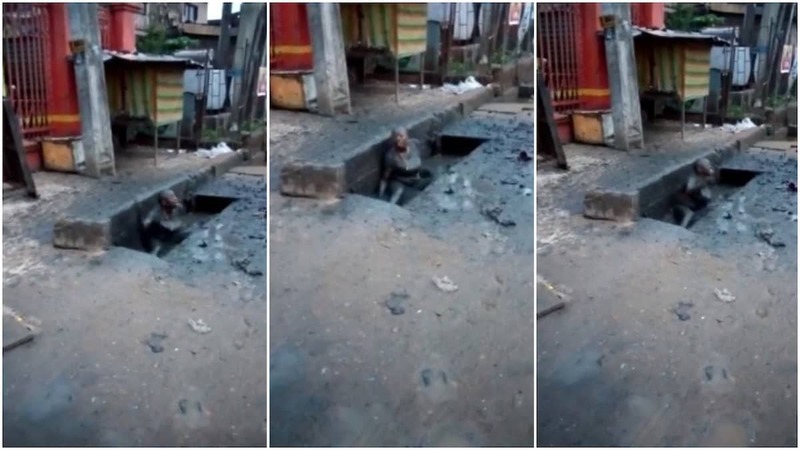 It was gathered that the incident happened at Ajangbadi area of Lagos and many residents gathered to watch woman who sat comfortably in a gutter and was captured chatting gibberish and playing with the dirty water. According to reports, the young lady slept in the hotel with a man and started displaying after sunrise. Lady ‘Runs Mad’ After Lodging With Man In A Hotel In Lagos.According to multiple online reports, an unidentified lady caused a scene early this morning at Ajangbadi area of Lagos state. It was claimed that the young lady lodged with a man at New Planet hotel till day break and allegedly went mad this morning in a huge dramatic display which was recorded on camera.It was gathered that the lady went mad in the hotel but was chased away by the hotel officials as she continued her public display inside a gutter while making senseless statements as can be seen in the video below. The incident left residents and passersby in shock after gathering at the scene to witness the drama. Further details were not given online as to the lady’s current condition. Meanwhile, it was recently reported that a mentally challenged man allegedly received healing during a students’ evangelism program in Ilaro, Ogun state. This deliverance was done on Saturday, February 3. This young man was said to have been mentally ill for about five years before he met his deliverance on the streets of Ilaro. The information was shared on Facebook by Redeemed Christian Fellowship (RCF), Ilaro chapter.